I think I’ve mentioned before on here that fried foods get a bad rep. Sure, if you roll on down to Burger King and wolf down two boxes of fries, then yeah that’s a bad idea. But homemade food that’s fried in healthy oils and served fresh can be pretty innocuous when it comes to their nutritional content. When cooked properly, homemade chicken fingers or french fries can contain very little oil left on them, and the little bit that’s there will mostly contain healthy, unsaturated fats with virtually no cholesterol. But obviously the downside here is that buying healthy oils like canola can be a bit more on the expensive side. 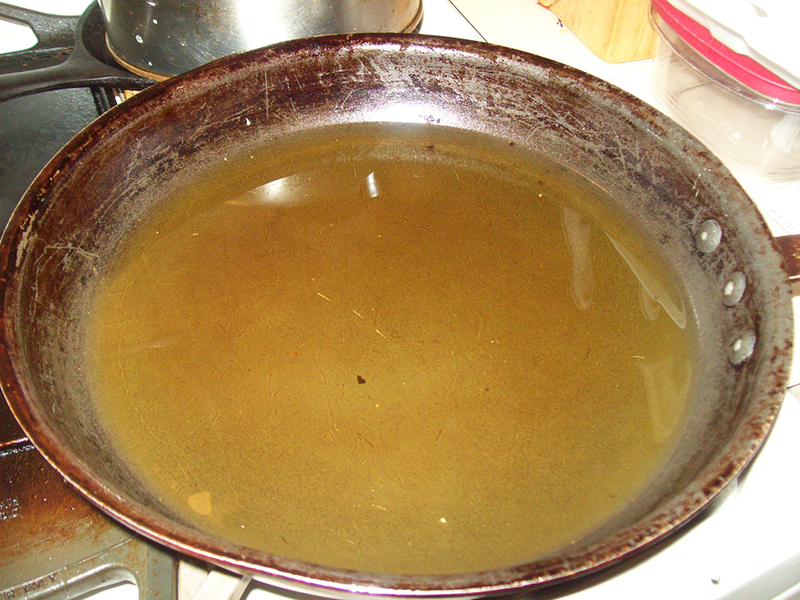 Fortunately, there’s a really easy way to cut down on its costs: saving your used oil after you finish frying. So yeah, there’s a few little specks here and there, but honestly those aside this oil could pass for “new” anyday. And fortunately, it’s not rocket science. You can tell if your oil is dirty. If it looks cloudy or has a lot of sediment in the bottom that’s clumping up, or it has a dark/burned quality to it, then yeah don’t bother saving it. But as mentioned you can avoid most of that stuff if you fry your foods correctly. Saving it is pretty easy too. Pretty much wait until the oil cools down to room temperature. Run it through a strainer or a sieve, to get any of the chunks out. 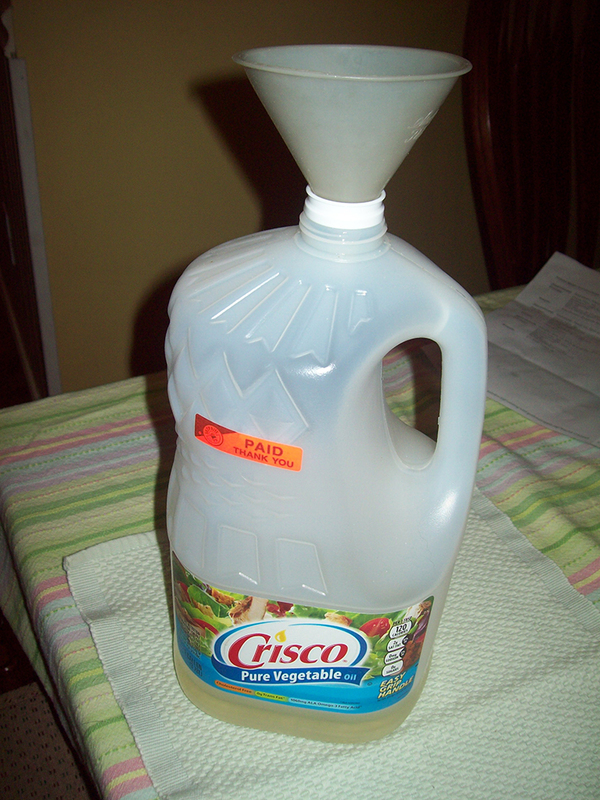 If it looks clear, grab a funnel, throw it on top of the bottle it came in, and add it back into the remainder. This can be done a number of times before you really need to change it. As long as it’s clean looking, it should be safe to cook with. The only sign it’s no longer good is if it went stale or rancid, which takes a while if it happens. Just give your oil a sniff before using it to make sure it’s alright. If it smells a bit off, then it’s time to dispose of it. If it still smells of oil, you’re golden. Keep using it and you’ll go months without having to buy new oil! Depending on how often you fry foods, this can add up to a lot of money pretty quickly. Best of all, it’s safe and easy. 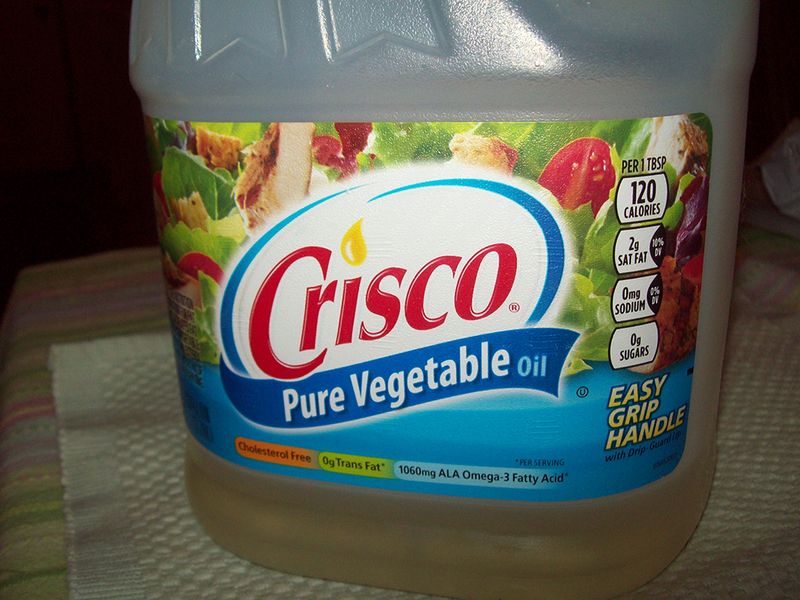 If you have a very full bottle of oil, you may actually want to store your used oil in a separate container. Not that it will “contaminate” the fresh oil or anything, but it makes it easier to keep track of the used oil and check if it’s still good to use. Any bottle or container will work fine with this. The one type of food that does tend to dirty your oil pretty quickly is anything fried in a dry, flour breading. So things like chicken fingers tend to make this kind of tricky, since the fine, powdery flour tends to fall off and into the oil. Thicker breadings, like breadcrumbs or things in batters are usually safe though. Be careful not to burn your oil. Leaving it on a high temperature for an extended period of time without actually cooking anything is the easiest way for the oil to get stale or rancid or simply go “off”. Posted on April 2, 2015, in Cheat Codes and tagged french fries, knowledge is power, On the cheap, pleasant surprises. Bookmark the permalink. Leave a comment.